If you have any problems with the reception of television broadcasts, do not rush to spend money to buy expensive television antenna. 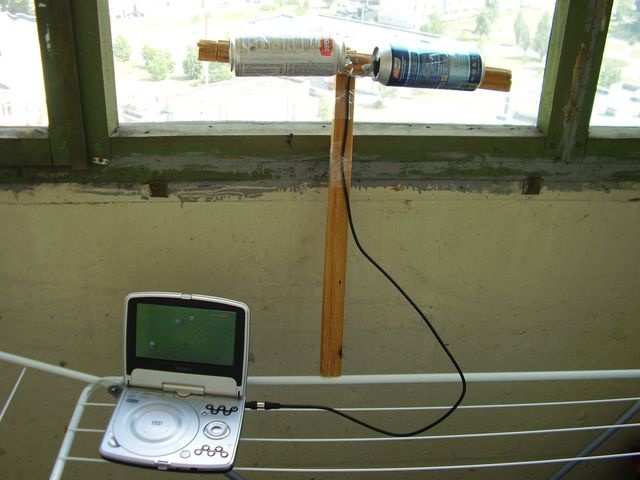 There is a simple but effective way to make the antenna most of the available tools, without spending a lot of time on it. two liter cans of beer, TV-cable RG 6U, two screws, or screws, wooden hanger, soldering iron, solder, tape. Thoroughly wash and dry the cans from the inside, not sticky dust. There is a perception that cans for the manufacture of TV antenna should definitely be preserved keys-openers. Empirically, it was verified that it is not necessary. Manufacturer of TV antenna start cable preparation. To do this, carefully cut in two places of the upper insulating layer of plastic, approximately 10 and 15 cm from the end of the cable, and remove this piece of insulation 5 cm Under it exposing the copper coil you want to twist in the same vein. The end of the cable is clear from all layers of insulation and shielding coil to the main veins, approximately 3-5 cm If banks are preserved openers, can be screwed and the core and screen to them, but this connection is less preferable, and it will affect the quality of television reception. One should not try to solder the cable to aluminum cans - nothing happens. Banks at either end with a nail punch one hole slightly smaller in diameter than the prepared screws. Wrap one of them the Central wire, the second twisted earlier mine of the shielding winding three to five turns. Screw the screws in the punched holes and propagte place fit between the cable and these screws. The best reception area, likely to be near the window or on the street. Based on this, measure the desired length of the cable (not vnatyag, but without a large supply), cut and mount this end of the cable plug to the antenna socket of the TV. Tape the Scotch banks to the hanger or to a wooden rail at a distance of 7.5 cm from each other. Now you will just have to find the area of best reception and secure ready antenna with the TV, and then enjoy watching television programs. Be extremely careful when working near the window to avoid falling. Do not put the excess cable working antenna rings, it degrades the quality of signal reception.